Pictured are Gary Wyllie, owner of C & G Automotive, and his two sons CJ and Nick; Michael Borr, president of Norwood Motor Parts, and John Tully, sales manager from Norwood Motor Parts. 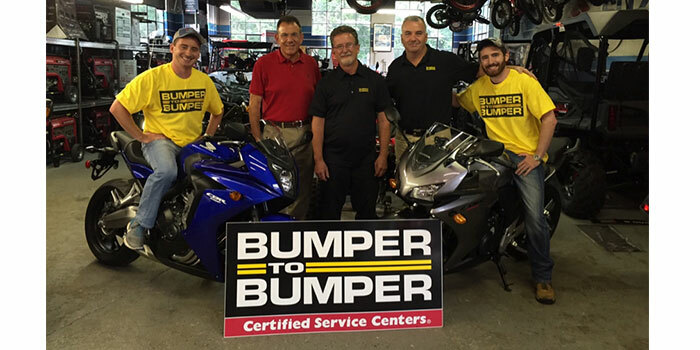 San Antonio Auto Value and Bumper to Bumper are proud to announce Gary Wyllie, owner of C & G Automotive in Sharon, Massachusetts, as a winner in the Perfect Stop Powersports 2016 Giveaway. C & G Automotive is a customer of Norwood Motor Parts, a member of the Aftermarket Auto Parts Alliance. The Perfect Stop Powersports Giveaway was open to technicians who completed a high-quality brake job using Perfect Stop products during the months of June and July. To accommodate a national sweepstakes with varying customer preferences, winners chose the power sports vehicle of their liking. Gary Wyllie used his winnings to purchase two Honda motorcycles, which he generously gave to his sons, CJ and Nick. This announcement marks the first recipient in this year’s giveaway. C & G Automotive was one of more than 75,000 entrants split between MyPlaceforParts users and Perfect Stop tear-off cards. The remaining winners will be announced in coming weeks.